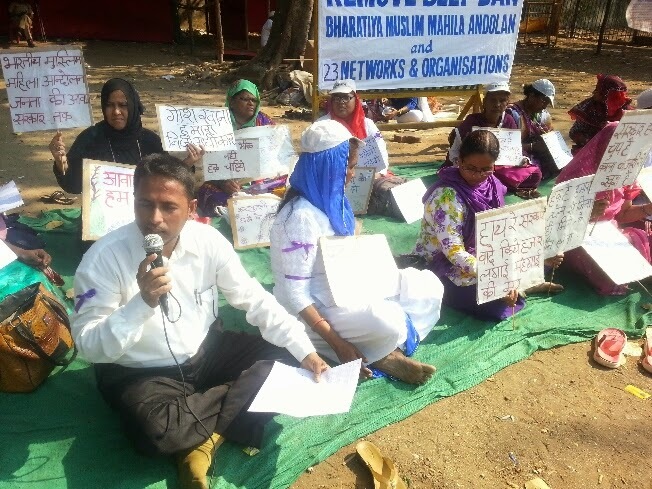 Bharatiya Muslim Mahila Andolan along with Ann Hakk Parishad, Kabeera Group, Awami Vikas Party, Bombay Catholic Sabha, Mahila Vikas Kendra, Committee for Right to Housing, Young Social Group, Hukook-e-Niswan Mahila Sanghatana, NEEDs, A-Z Social Service, Idrisi Jamaat, Sailani Education Foundation, Saheli Sanstha, Social Foundation, Centre For Study of Society and Secularism, Shramik Yuva Mukti Sanghatana, Anjuman-e-Islam-Sahara, Samjhauta Mahila Mandal, Mahila Shakti Mandal, Priyadarshini Mahila Mandal, Jan Seva Mahila Mandal, Garima Mahila Mandal, Don Bosco. 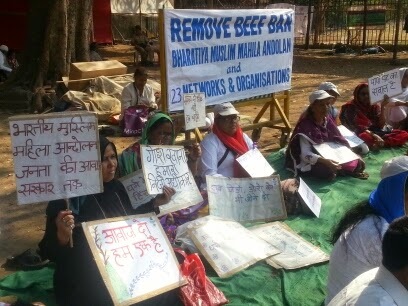 With 6000 signatures backing them, BMMA and the above 23 organisations, networks and alliances held at the Azad Maidan at 3 pm was attended by more than 250 Muslim, dalit, Christian women who demanded that the Maharashtra government lift the ban on the slaughter, sale and possession of beef. This ban is not only anti-minority but also anti-dalit and infringes on the fundamental right of citizens to decide what they want to eat. This ban is violative of Article 21 which violates the quality of life and Article 29 that bars discrimination against minorities by race, language, religion and culture. Khatoon Shiakh of the BMMA said that this ban is being challenged by many in the court and we urge the state to lift the ban. 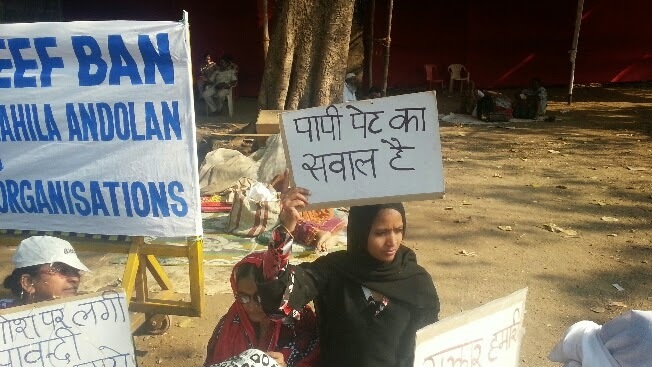 Dr. Noorjehan Safia Niaz said that their organization works with Muslim women across the country and we see Muslim women suffering immense health problems. A cheap source of protein is being denied to them as a result their health will suffer further. 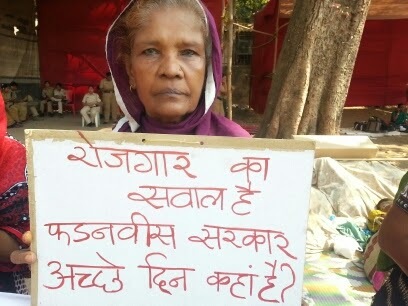 This move is casteist and communal. 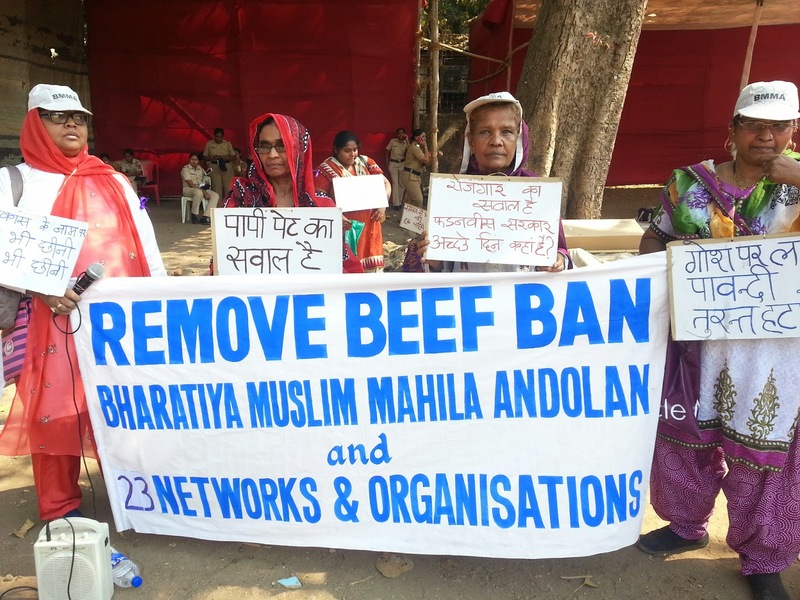 Bharati Shetty and Nirmala Kahar of Mahila Shakti Mandal and Samjhauta Mahila Mandal say that although they are hindus they do not support the ban as it infringes on people’s right to eat. 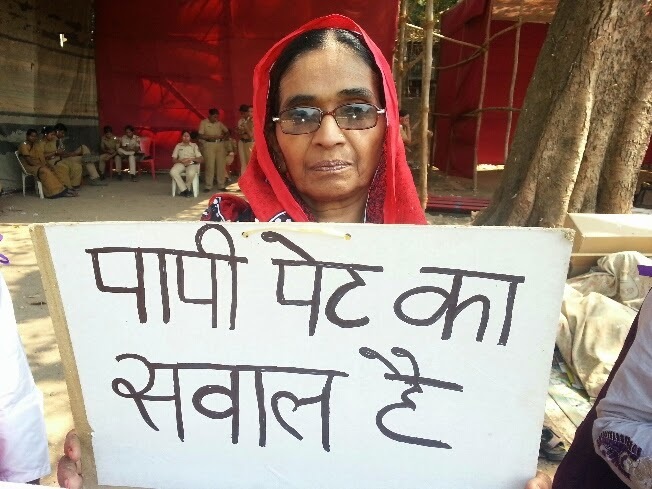 The decision taken by Chief Minister of Maharashtra to ban all kinds of beef, it slaughter and even its sale is not just anti-minority but also anti-dalit and anti-poor. Lia Caldeira who being a Christian and protesting against the ban has said that this is an anti-minority law which must be changed immediately. 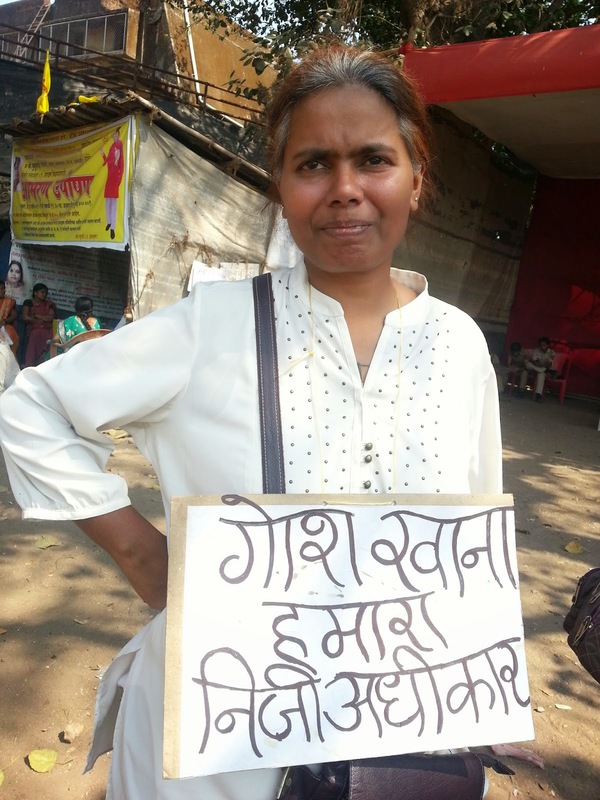 · Increased unemployment in the communities who are dependent on the beef trade which includes slaughter and sale. 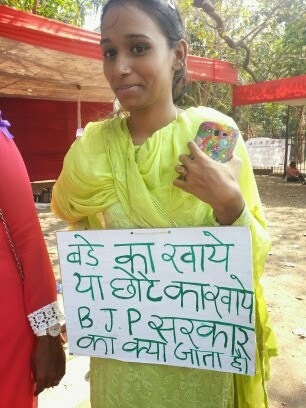 · Increased insecurity within the minority community which looks at the BJP-SHiv Sena Government with suspicion now as it infringing on the basic fundamental rights of citizens. 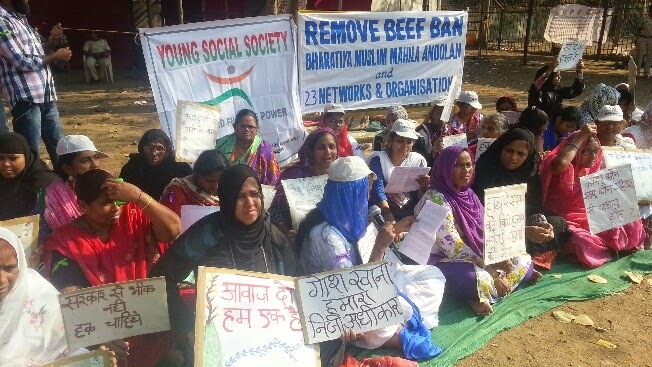 The gathering has demanded an immediate lifting of the ban on beef slaughter, trade and consumption. 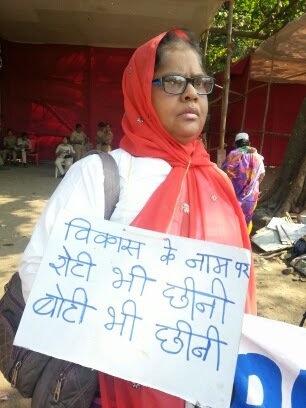 Some members of the gathering submitted the demands to Devendra Phadnavis and the Chairperson of the State Minority Commission.